(Oded Balilty/Associated Press) Though devastating, disasters like the earthquake that hit China in May can force countries to modernize their infrastructure. THE EARTHQUAKE THAT struck China's Sichuan Province in May left behind scenes of almost apocalyptic devastation: mountaintops sheared off into valleys, cities reduced to rubble and dust, cracked dams, collapsed bridges, and at least 80,000 dead. If the Chinese government is to be believed, the earthquake also did something else: it helped the country's economy. A little over a month after the quake, the State Information Center, a Chinese government research body, announced that the massive rebuilding effort, and the billions of dollars it would pump into the Chinese economy, would far outweigh the economic losses from the quake, enough to bump up national economic growth by 0.3 percent - a small but not insignificant part of a 2008 growth rate most estimates put at just under 10 percent. Traditionally, analysts have cautioned that Chinese growth figures should be greeted with skepticism, but, according to one school of economic thought, there may be something to the idea that the quake served as a brutal stimulus. In fact, some economists argue that hurricanes, earthquakes, floods, volcanic eruptions, ice storms, and the like, despite the widespread destruction they leave behind - indeed, largely because of it - can spur economic growth. Rebuilding efforts serve as a short-term boost by attracting resources to a country, and the disasters themselves, by destroying old factories and old roads, airports, and bridges, allow new and more efficient public and private infrastructure to be built, forcing the transition to a sleeker, more productive economy in the long term. "When something is destroyed you don't necessarily rebuild the same thing that you had. You might use updated technology, you might do things more efficiently. It bumps you up," says Mark Skidmore, an economics professor at Michigan State University. "Disasters help people think about things differently." Studies have found that earthquakes in California and Alaska helped stir economic activity there, and that countries with more hurricanes and storms tend to see higher rates of growth. Some of the most recent work has found a link between disasters and subsequent innovation. The study of the economics of disasters remains a small field, with few major papers. And skeptics charge disaster economists with oversimplifying enormously complex economic systems and seeing illusory effects that stem only from the crudeness of the available economic measuring tools. But as more people move to riskier areas, and the world's climate shifts, the debate over natural disasters and their impact has been gaining in resonance. The population of coastal hurricane zones and cities, from San Francisco to Mexico City to Tokyo, that sit on or near major seismic faults, continues to grow, and climatologists warn that climate change could increase the number of extreme weather events in many parts of the world. While not even the most fervent believer in the economy-catalyzing qualities of disasters would wish for one, the study of the costs and possible benefits of such events may help us better understand how to target recovery efforts - and, perhaps, how to replicate the salutary effects of disasters without the disasters themselves. The economic study of natural disasters has roots in the study of human disasters - in particular, the effects of wars, real and imagined. In the 1950s and 1960s, analysts at the RAND Corporation think tank, trying to work out the total impact of a nuclear attack on the United States, created models for how such an attack would affect our economy. The best-known of these thinkers was Herman Kahn, a physicist and systems analyst notorious for his willingness, even eagerness, to reduce the seemingly unthinkable to dry actuarial calculations. In his 1961 book, "On Thermonuclear War," Kahn wrote that, thanks to the United States' strong growth rate at the time, even a nuclear attack that destroyed all of its major metropolitan areas and killed one-third of its population "does not seem to be a total economic catastrophe. It may simply set the nation's productive capacity back a decade or two plus destroying many 'luxuries.' "
Natural disasters provided an opportunity to see how societies actually recovered from such large-scale shocks. In 1969, Douglas Dacy and Howard Kunreuther, two young analysts at the Institute for Defense Analyses, published a book called "The Economics of Natural Disasters," one of the first attempts to quantify the economic impact of catastrophes. The book was largely a case study of the Great Alaska Earthquake of 1964, the most powerful ever recorded in North America. Dacy and Kunreuther found that the money that rushed into the Alaskan economy after the temblor, as well as generous government loans and grants for rebuilding, meant that many Alaskans were actually better off afterward than before. "We got a lot of hate mail for that finding," recalls Kunreuther, now a professor of business and public policy at the University of Pennsylvania's Wharton School. But though it may have proved unpopular among Alaskans still dealing with the aftermath of the disaster - which killed 131 people, destroyed several towns along the Alaskan coast, and leveled portions of Anchorage - the idea that disasters trigger short-term growth has gained adherents among economists. "The data are pretty clear about it," says Gus Faucher, director of macroeconomics at Moody's Economy.com, an economic consulting firm. Faucher has looked at disasters in regional US economies and found in some cases a dramatic impact. The year after Hurricane Andrew struck southeast Florida in 1992, causing what would today be more than $40 billion in damages, the state saw sharp increases in employment thanks to new construction jobs. And Faucher credits the rebuilding jobs and aid and investment that followed the 1994 Northridge earthquake for helping pull the Los Angeles area out of its early-1990s economic slump. Hurricane Katrina, Faucher says, has proved an exception: Because so many residents left the area and because government aid was so slow to arrive and insurance payouts so low, the area didn't see an economic bounce. To critics of this line of thinking, the problem is that it is, at best, a partial picture. It ignores, they argue, the fact that the money and labor that go into post-disaster rebuilding are simply being redirected from other productive uses. "If you're a carpenter, a trash remover, a physician, you may be made better off, but the things that those producers would have otherwise produced are not going to be produced," says Donald Boudreaux, an economics professor at George Mason University. "Over any reasonably relevant period of time, society is not made wealthier by destroying resources," he adds. If it were, "Beirut should be one of the wealthiest places in the world." The research on longer-run effects, its supporters argue, is less vulnerable to this criticism, because the key factor is not merely new stuff but better stuff. In this model, disasters perform the economic service of clearing out outdated infrastructure to make way for more efficient replacements - Mother Nature's contribution to what the Austrian economist Joseph Schumpeter famously called capitalism's "creative destruction." The economy, as it recovers, actually becomes more productive than it was before, and some economists argue that the effect can be seen decades after the disaster. When Dacy and Kunreuther looked at Alaska after the quake, they found that the state's fishing fleet, refurbished after being decimated by the ensuing tsunami, was able to increase its yield over pre-quake levels. And the building industry grew more innovative, as well. Whereas before, construction had been limited to the warmer months of the year, the pressure to rebuild quickly drove the adoption of new methods and technologies like the use of "visqueen" plastic films to protect construction sites, allowing work to continue year-round despite the bitter Alaskan winter. Other, more recent academic work has taken a broader look at the question. Mark Skidmore of Michigan State, along with the economist Hideki Toya of Japan's Nagoya City University, published a 2002 paper in the journal Economic Inquiry that mapped the disaster frequency of 89 countries against their economic growth over a 30-year period. The paper controlled for everything the authors could think of that might skew the findings - including country size (large countries would presumably experience more natural disasters), size of government, openness to trade, and distance from the equator. Skidmore and Toya found that, in the case of climatic disasters - hurricanes and cyclones, as opposed to earthquakes and volcanic eruptions - the more the better: nations with more climatic disasters grew faster over the long run than the less disaster-prone. Why only climatic disasters? The authors suggest that, as we've gotten better at forecasting violent weather, its human costs, at least, can be mitigated much more easily than with geological disasters, which still take us by surprise. Jesus Crespo Cuaresma, a professor of economics at the University of Innsbruck, has found some support for Skidmore and Toya's argument. In a paper published earlier this year, Crespo Cuaresma examined post-disaster rebuilding efforts in developing countries and found that, at least in wealthier developing countries like Brazil and South Africa, there is indeed a tendency to use the rebuilding process as an opportunity to upgrade infrastructure that might otherwise have been allowed to grow obsolete. 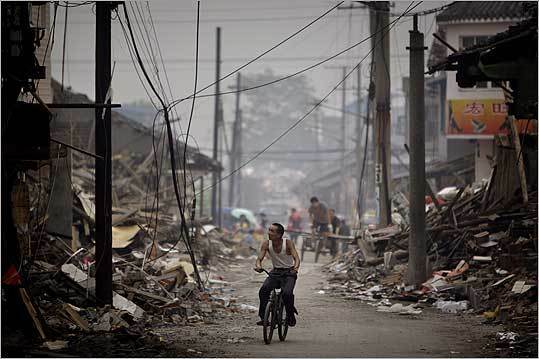 Other work, however, has challenged the disaster-growth linkage. Ilan Noy, an assistant professor of economics at the University of Hawaii, has looked at long-term growth and disaster data and found that natural disasters hurt growth in the short term, and can barely be said to have any effect over the long run. According to Noy, the problem with studies that see a long-term positive effect is that their measurements are too crude - they average growth over decades rather than breaking it down into shorter periods of time, and they don't account for the varying severity of the disasters in question. Like Crespo Cuaresma, Noy focused on developing countries (Noy argues that it would be impossible to find any impact at all on national economies in the wealthy world). And he concedes that aid money and materials do tend to stream in after a major catastrophe. It's just that at the same time an even greater amount of private money is leaving the country. "There's a perception that it's more of a dangerous place," he says. Of course, even analysts of the "creative destruction" school don't see disasters as good things - disasters kill people, often in great numbers, and uproot many more. Skidmore is careful to point out that, even from a coldly economic standpoint, the most productive disasters are those that don't take lives. In harming buildings but not people, they encourage societies to invest less in vulnerable, immovable things like factories, he argues, and more in human capital, in skills and education, "things that won't be destroyed if a disaster strikes," he says. Nonetheless, a recovery planned only to maximize growth might well conflict with more basic humanitarian concerns. Those most in need of help and resources in the wake of a disaster - the poor and the uninsured near-poor - are going to contribute the least to growing the economy as it recovers. On the other hand, those best equipped to find opportunities for growth in the rubble - large corporations and the wealthy - are also those best able to survive the catastrophe on their own. "If you took all the disaster relief money and gave it out to the corporations affected, you will have spent a lot of money very intelligently in terms of urban growth," says Larry Rosenthal, executive director of the program on housing and urban policy at the University of California, Berkeley, "but not in terms of fairness." Indeed, disaster recovery has attracted critics who see it as a predatory industry in disguise; in a book published last fall called "The Shock Doctrine: The Rise of Disaster Capitalism," the journalist Naomi Klein argued that corporations, first-world governments, and aid organizations treat natural disasters as chances to open up new markets - with dismal results for the recovering nations themselves. It may be, then, that disaster economics works best as a guide in those times when we don't have disasters to contend with. Investing in human capital, replacing outdated plants and infrastructure - the things that Kunreuther and Skidmore argue disasters drive us to do - are also, it turns out, good ideas even in the absence of a crippling catastrophe. If the disaster economists are right, calamities are simply pushing societies to make the sort of sound economic decisions that inertia or fear or bureaucratic sclerosis prevents them from otherwise making. Governments and businesses might do well to adopt some of the urgency and innovation of a post-disaster mind-set even in more clement times.